Review of Rogue Shakespeare Oatmeal Stout | Beer Apprentice - Craft Beer News, Reviews, Interviews and Info. 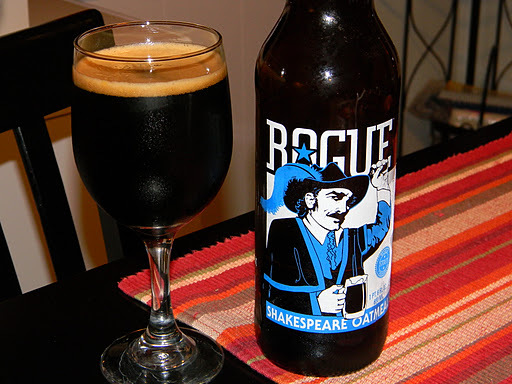 For today’s craft beer review I’m going to be sampling another brew from the Rogue Brewing Company located in Newport, Oregon called the Rogue Shakespeare Oatmeal Stout. It’s been awhile since I last had a beer from Rogue, so I’m eager to get this in a glass and give it a whirl. First, let’s see if we can find any information about the beer on the website, rogueales.com. Ebony in color with a rich creamy head, earthy flavor and a mellow, chocolate finish. This beer came in a 22 oz. bottle and it has an ABV of 6.1%. The appearance on the Shakespeare Stout was almost straight black. Most Stouts tend to have some ruby colored highlights, however this beer had light brown highlights. This was maybe the darkest beer I have ever seen. The head was of a tan color, smooth and creamy. It wasn’t real large, but it did have great retention and left some worthwhile lacing behind. The aroma was very similar to other Oatmeal Stouts I’ve had. Tons of dark roasted malt with hints of cocoa powder and bittersweet chocolate. It had some coffee notes, but they were not very forward or protrusive. It seemed to have a very “earthy” fragrance along with subtle hints of yeast also. I didn’t find much by way of dark fruit, however the chocolate more than made up for any lack of sweetness in the smell. Overall, it was fairly well balanced and fitting for the style. The taste brought forth more of the roasted malt. It actually became somewhat “smokey” as I sipped. The coffee flavors were significantly more forward in the taste and they blended with the chocolate most admirably. I even detected a dry walnut type of flavor. Hmm, that’s different. A small bit of the yeast and earthiness hid underneath to provide a touch of bitterness on the sides of the tongue to finish off the savor. The mouthfeel was medium to full, very dry and mostly smooth (a little bit of sharpness was felt from the coffee). It wasn’t as creamy as I thought it might be, but it did have some slightly chewy aspects. The palate was covered with a wash of flavors that hung around for a great long while. Overall, I thought this beer was more than solid. It’s good all around. It was super easy to drink, which made it darn near sessionable. I think it would be perfect for a chilly afternoon, evening or as a night cap. Rogue always makes a great brew and they have always been one of my favorite brewers, so I don’t think I would have any trouble drinking this again. I would recommend giving it a try if you happen to see it sitting on a shelf somewhere. It’s not quite the best Oatmeal Stout I’ve ever had, but it’s definitely not one to be taken lightly. Thanks for reading and commenting everyone. I hope that you are still finding the reviews enjoyable and entertaining. Until next time.